So, Leonie had offered to leave a few of Swirly Girl’s books in various places around the world, as we travel thru it – specifically the Algarve in Portugal, Iceland (over New Years) and Copenhagen in Denmark. As I was off to Copenhagen for work, I offered to leave one there. 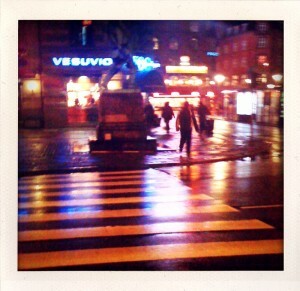 Copenhagen is a lovely city, at least for me. I find it to be clean and interesting, the people are lovely, and the weather is usually nice. It also helps that we have friends there, so it’s an easy decision to go. 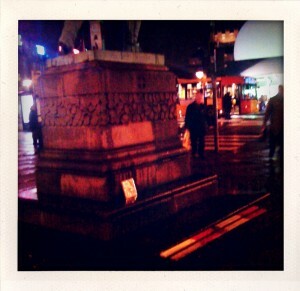 The night I had free to do the book drop was a very cold, very dark and almost snowing one. I headed up from the hotel to try to find some dinner around the middle of town. One of the main attractions in Copenhagen (so I’m told) is a theme park called Tivoli, tho the Danish pronounce it Tuuli. It’s a very old (1843) amusement park, or some parts are – a lot of the rides are very new, but have the look and feel of being 150 years old. It’s rather cool. Amusement parks are not something I’m particularly big on, especially when I’m on my own – they are much more fun in a group. But I had a walk around, intending to find somewhere to leave the book. It seemed like a nice place to leave it – lots of people, cool theme, nice place for a photo op etc, but I couldn’t find a suitable spot for it. There were basically too many people around, and no where I could find was, in my mind, suitable. And that was the problem: “Nowhere suitable”. What the hell WAS “suitable” anyway? 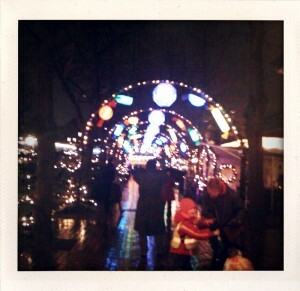 I continued to walk around Tivoli, taking in the lights (and trying not to get rained/snowed on). Eventually, with a growling stomach, I headed out to find some dinner – and somewhere “suitable” to leave the book. I headed up the road a bit to find out if the big ball thing in the main town square was a good spot. On getting there, I found it was mostly a construction site and the big ball was for the climate conference. Or rather, for some corporations promotion of their “green” products. Side rant: Almost every billboard I saw, especially in the airport, was some company pushing “hey, be green using us”. Problem is, a lot of them are causing the problems – eg car companies, oil companies, travel companies and airlines, and the likes of Coke. Maybe they should have just said “keep consuming our products, you sheep, we hope that the inevitable climate change doesn’t stop you buying more of our crap”. But I digress. Eventually, I found what I thought was a “good enough” spot – on the plinth of a statue, right by a bus stop and a cross walk, on Hans Christen Anderson Boulevard. Oddly, given how much I use Google Maps, about 20m from the spot that Google Maps considers to be “copenhagen” if you search for it. Sadly, it was dark and my iphone doens’t have a fantastic camera, but you can see where it was left. Also keep in mind – especially those in the southern hemisphere enjoying summer – that it was only about 7pm, but it had been dark for around 4 hours already. So, it was fun being part of the project, but the pressure to find that “somewhere suitable” was quite hard. I hope someone found it and enjoyed it. — Nic, aka Mr Postcards From. You are so fortunate to travel so much, sistah. I am jealous :-) And I couldn’t agree more ~ most companies have no idea what green means besides jumping on a marketing bandwagon.